Waiter, bartender, philosophy professor, husband, father, and now talk show host. Every day Andrew McKay brings real life experiences into his discussion of current events on the Pensacola Morning News, 5-9am weekdays. Andrew has invested himself so intensely in local events and activities that people are surprised to find he’s only been living here for four years. But in that short time, he has helped NewsRadio win two Edward R. Murrow awards and been named “Best Morning Radio Show” three years in a row by InWeekly’s Best of the Coast. The reason so many key influencers in the Panhandle listen to his show every day is because Andrew has such a strong reputation for getting the story right and for being fair, even to those he disagrees with. In addition to standing weekly interviews with the Pensacola Police Department, Escambia County Sheriff’s Office, and US Congressman Matt Gaetz, Andrew regularly interviews County Commissioners, School Superintendents, State Legislators, and the key leaders of every other local organization—from the Blue Angels to IMPACT 100 to ECUA to Gulf Coast Power and UWF. 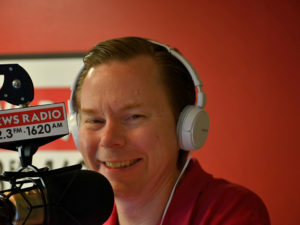 He is also the only radio host who regularly interviews both Pensacola Mayor Ashton Hayward and Gulf Breeze Mayor Matt Dannheisser. Andrew has established these strong relationships because people know they can trust Andrew to ask thoughtful, fair questions and to represent their side accurately in any discussion. It’s this reputation that makes Andrew such a valuable voice for product endorsements. When he talks, people trust him. So when he says Pensacola Honda and Mathnasium are great companies, they know he means it. And although he tackles difficult topics and offers strong opinions, Andrew deliberately tries to include everyone in the conversation. He believes radio should bring people together rather than divide them, which is why companies can arrest assured that associating their brand with him is safe and will be profitable.